Living-in-place means following the necessities and pleasures of life as they are uniquely presented by a particular site, and evolving ways to ensure long-term occupancy of that site. . . . It is not, however, to be thought of as antagonistic to civilization, in the more human sense of that word, but may be the only way in which a truly civilized existence can be maintained. Somewhere in the swirl of life, each of us ponders three essential questions: "Who am I?" "Where am I?" and "What am I supposed to do?" We often consider the first question in isolation, as if it were the true key to our existence—as if the matter of who we are could be resolved independently of the two remaining questions. But all three of these questions must be answered in consort, as together they articulate the totality of the human condition. We do different things with varying degrees of understanding and purpose. We are born, live, feel, think, act, move, settle, and die. Questions of our existence and action are separable neither from each other nor from place—but it is place that we have most often ignored. With this book, I wish to argue that without a fundamental realization of the question "Where are we?" human meaning is not stable, and the logic of our own being collapses. Each of the three essential questions is connected to the other two; to deeply comprehend where one is is also to know who one is and to understand what needs to be done. As members of Homo sapiens var. "technoeconomicus," we live in a dominating culture that mistakenly expects us to resolve the puzzle of our own existence through compartmentalizing our lives and separately examining each existential question. This approach has failed; many of us are more alienated than ever before. Just past the turn of the millennium, we have all become, in certain fundamental ways, homeless. A number of factors have contributed to this "homeless" condition: the Cartesian assumption of separation of mind from body; the evolution from ecosystem-based to globally based economies; the drug trip of fossil fuel; the substitution of mechanism for organicism; the dissolution of space and time by electronic communication; and the erasure of uniquely placed culture by all of the above. We wander the postmodern landscape like hunter-gatherers, searching for bits and pieces of meaning, unconsciously emulating the atomized consumers of economists' elaborate models. Governments and transnational corporations expect us to substitute a shallow awareness of the entire globe for whatever deep wisdom and affection we might have had for a specific place. In the process of becoming postmodern, we have abandoned the notion of "home," and like innocent natives presented with beads and trinkets of shining luster and unfamiliar purpose, we have surrendered our former homelands to the new gods of consumerism, transience, shallow information, global communication, and ever-expanding technology. We are trained in schools and universities to "become" before we "locate." The ends of these hopeless wanderings, in terms of both purpose and place, very often elude us. The question "Where are we?" has a deep, sustaining ring to it. It is a simple question with a deceptively complex answer. To some readers, we are where our address is—our street, city, county, state, and nation. To a few others, we are in some division of territory on earth, perhaps marked by a particular topography and climate. Many others might find the question absurd: How are we to answer? We are at many locations at different times. Planners, landscape architects, geographers, and others occupied with mapping, planning, or designing places are supposedly more aware of "where they are" than most—yet how deeply do any of us really know where we are? The third question—"What am I supposed to do? "—is even less easily dismissed or trivially answered. When considered in relationship to the other two questions, it calls forth a host of corollary concerns about how we currently live and how we might live best in relation to the land we occupy. Do we live deeply within the land or shallowly upon it? In community with other living things or at their peril? Do we live in a manner that presumes permanence or broadcasts transitory detachment? I have been a resident of the hot, fertile Sacramento Valley of California for thirty years, yet I am still learning the crops that are grown on the prime agricultural fields one quarter-mile from my house, and the sophisticated mechanical, hydraulic, and chemical methods by which those crops are mostly produced. Conversely, my agricultural neighbors still have much to learn of the adjacent academic world I "inhabit"; my reality is another space to them, and vice versa, and our respective interpretations of life's purpose are apt to be greatly divergent. In North America we are confused by caricatures of each other while we share common landscapes—in my case the urbanizing agricultural fringe in a low-elevation former seabed, then grassland, now agricultural quilt in the Mediterranean climate region at the center of a territory now politically known as California. In spite of my quarter-century of residence, there is much I do not know about the place and about my neighbors, human and nonhuman, living and inanimate. After a decade of self-conscious investigation, I have discovered that the more I know, the more there is to be known. Much has been written about contemporary severance from nature and the loss of community, identity, purpose, and sense of place. Our places and communities have been usurped by machines, sprawled out by the automobile, homogenized by consumer culture, seduced by the globalizing economy, trivialized by television, and disconnected from deep wisdom by the shallow superficiality of the "electronic superhighway." The evolutionary tendency of humans to attach themselves to place and to one another has been co-opted by a culture that feigns such an attachment through advertising but seems only to demand that we consume more, communicate frivolously and electronically, and care less. The academic world has compartmentalized knowledge and occupation while the corporate world has globalized the "location" of business and commerce. However, social trends are most often accompanied by their opposites. A number of simultaneous movements toward "relocalization" are now converging that challenge many of the basic and most dis-placed assumptions of postmodern culture: grassroots watershed conservancies, "Friends of . . ." groups for particular natural features, holistic ecosystem management efforts, coordinated resource management plans (CRiMPs), community-supported agricultural establishments, alternative local currencies, farmers' markets—even microbreweries that produce beer with proudly local labels. In particular, a body of theory and technique with great significance to the nature of community life, public citizenship, personal lifestyle, regional planning, ecosystem management, and education is coalescing around the term bioregion. A bioregion is literally and etymologically a "life-place"—a unique region definable by natural (rather than political) boundaries with a geographic, climatic, hydrological, and ecological character capable of supporting unique human and nonhuman living communities. Bioregions can be variously defined by the geography of watersheds, similar plant and animal ecosystems, and related, identifiable landforms (e.g., particular mountain ranges, prairies, or coastal zones) and by the unique human cultures that grow from natural limits and potentials of the region. Most importantly, the bioregion is emerging as the most logical locus and scale for a sustainable, regenerative community to take root and to take place. In reaction to a globally shallow, consumer-driven, technologically saturated world where humans are alienated from nature and offered simulations of it instead, a bioregion offers an appropriate venue for the natural predisposition toward graceful human life on earth. The bioregional or "life-place" concept suggests the efflorescence and emplacement of biophilia, our innate affection for the totality of life in all its forms. Although by no means a unified philosophy, theory, or method, the bioregional approach suggests a means of living by deep understanding of, respect for, and, ultimately, care of a naturally bounded region or territory. Words ending in -ism are conceptually dangerous and immediately raise red flags. Bioregionalism is no exception, coming under criticism as utopian, idealistic, oversimplified, or just plain fallacious. To minimize needless risk to the efficacy of the concept, I hereafter try to minimize use of the suffix -ism in the remainder of this writing. Instead, I use the words bioregion and life-place interchangeably to evoke either a particular place on earth or the general concept of such places. Life-place is perhaps the better of the two synonyms; it is lighter and more flexible on the tongue and in the mind. But like the word/concept sustainability before it, bioregion has become too prevalent, powerful, and useful to ignore. Bioregion and its related terms have entered the lexicons of planning, design, geography, and ecosystem management and now appear in academic journals, popular magazines, and planning reports. Geographer Hartwell Welsh lists sixteen California bioregions; the Jepson Manual, ten "floristic provinces"; the California Biodiversity Council, eleven bioregions; journalist/author Phillip Fradkin, seven eco-cultural "states" within the greater state of California. In defining twenty-one North American ecoregions, the Sierra Club wrote: "Nature has messy boundaries, and systems that blend into each other—so do our ecoregions." The notion of life-place is informed by various disciplines. From ecosystem geography comes a fuzzy natural way for humans to partition the earth's territories. From ecology comes an understanding of the role of abiotic conditions, disturbance, inter- and intraspecies competition, predation, and symbiosis that results in spatially distributed natural assemblages or associations, if not communities. From ecosystem management comes a pressing need to holistically manage land, habitat, resources, and species in reasonably sized, scientifically defensible chunks. From regional theory, planning, and landscape architecture comes a battery of methods and techniques for analyzing, planning, and managing land on the regional scale. From architecture and sustainable development comes the possibility of tuning the built environment to the conditions of the natural region. From alternative economics come the rudimentary means of emphasizing and strengthening local and regional economies. From sustainable agriculture come specific means to link local food producers and consumers in reasonably scaled, regenerative relationships. From social and political theory comes a resurgence of participatory democracy and civic responsibility focused on place and capable of solving regional environmental problems. Finally, from artists, poets, painters, and writers emerge a sense of the true nature of culture and an inkling of why we might want to do all this in the first place. If this were all, however, bioregional thinking could still be dismissed as merely another utopian byproduct of a culture obsessed with buzzwords, shallow information, and surface imagery. However, all across the United States, North America, and elsewhere, groups of people of widely disparate backgrounds within common, naturally definable regions are sitting down, discussing issues, reaching compromises, and making plans for areas of land and resolving resource and environmental issues in what can only be called bioregional actions. Judith Plant reports that this "naming of something that is already going on is the power of bioregionalism." What is going on is the widespread occurrence of grassroots, on-the-ground action toward resolution of environmental and social issues by voluntary, nonprofit groups that strongly identify with naturally bounded regions and local communities. This book simply presupposes that the various regional relocalization movements are better off together than apart. Might not a focus on the potential regional "foodshed" relate to the protection of biodiversity? Could the geography of energy production, distribution, and use relate to the viability of a regional or local economy? Would an enhanced local art and literature contribute to a more civic, participatory democracy? The symbiosis made possible by considering these dimensions together is too potent to resist. The ultimate measure of a convergent bioregional approach, if it is to influence the mainstream, will be its contribution toward regenerating local cultures, ecosystems, and resources into the indefinite future. A life-place framework will be judged not on how "warm and cuddly" it makes people feel but on whether it contributes in a physical sense to the fulfillment of needs of life on earth: clean water and air; sufficient food, shelter, and clothing; peace from violence; a sense of meaning in life and a motivation for continuing to live; and enough of all of this to sustain life for other living systems as well as for our own species. When I look beyond the pragmatic requirements of a life-place approach, I see a simple set of axioms: People who stay in place may come to know that place more deeply. People who know a place may come to care about it more deeply. People who care about a place are more likely to take better care of it. And people who take care of places, one place at a time, are the key to the future of humanity and all living creatures. At first glance, these axioms might imply a linearity of logic, but many of the effects are also causes. In essence, the idea of a life-place or bioregion connects natural place, awareness, knowledge, wisdom, affection, stewardship, sustainability, and, most important, action, as a "fuzzy set" of nested and covariant concepts. Embedded in the bioregional idea, therefore, is a very general hypothesis: that a mutually sustainable future for humans, other life-forms, and earthly systems can best be achieved by means of a spatial framework in which people live as rooted, active, participating members of a reasonably scaled, naturally bounded, ecologically defined territory, or life-place. I work in an office and live in the other rooms of a house in a subdivision in a city in the state of California in a political nation called the United States of America. I have an official address, and I am a census data point. I reside in a city and within a county. I live in a fire district, a school district, a water and flood control district, an air pollution control district, a hospital and ambulance district, a senatorial district, a congressional district, an assembly district, a state senatorial district, and a county supervisorial district. I also live in a voting precinct and will die in a cemetery district. I am within a water quality control board district, a highway maintenance district, a landscape and lighting assessment district, and a cellular phone communication cell. I'm in a zip code and an area code. I live along an electric utility branch, a cable television line, and a natural gas network. I live within a sewage treatment service area and a solid waste management district. Virtually none of these spatial zones coincide. There is, however, another way in which I may consider where I am. I also live on Yolo clay loam soil at an elevation about fifty feet above mean sea level, two miles north of Putah Creek and two miles south of Willow Slough, eight miles west of the Sacramento River at latitude 38.8¢ N near the West Coast of the North American continent. I live in a mild temperate, interior, Mediterranean climate zone on quaternary alluvium several tens of thousands of feet deep. On average, about eighteen inches of rain fall in my area each year. I live on a former sedimentary outwash plain that became first grassland/savanna, then cattle pasture, then orchard, and then tomato and row crop field, and that now is a housing subdivision. Near my house, one to two miles to the north and south, are lands that were once riparian forests, and three miles east are former seasonal and permanent marshlands. Most of this land is now prime agricultural row crop, field crop, pasture, and orchard land. Groundwater lies sixty feet beneath my house. Blue oak savanna and oak woodland hills lie ten miles upstream; chaparral, riparian forests, and mixed oak woodlands, twenty miles up. Twenty miles south of me is a river delta and farther west a freshwater estuary where that river meets the coastal tides. Fifty miles southwest is an ocean. I live along the migratory routes of hundreds of bird species. I share my immediate surroundings with crows, magpies, jays, mockingbirds, flickers, possums, dogs, cats, goldfish, and turtles. There are snails, ants, sow bugs, earthworms, mealybugs, tomato worms, spiders, flies, bees, fleas, wasps, cockroaches, moths, crickets, and literally hundreds of insects and arachnid species I could not possibly name. Also sharing the immediate areas near my home are innumerable exotic and a few native species of trees, grasses, shrubs, vines, annuals, and perennials. A half-mile to two miles or so away are foxes and raccoons; hawks, egrets, herons, kites, ducks, geese, swans, stilts, avocets, willets, killdeer, and pigeons; lizards; and blackfish, carp, bass, suckers, and other fish. Countless hundreds of thousands of small and microscopic organisms crowd the entire region around me. If my species vanished tomorrow, the land would gradually assume a new equilibrium, with many new exotic species, but with many others similar to those of its condition several hundred years ago: scattered grassland and valley oak trees here, marsh and riparian forest nearby, with blue oak savanna, woodland, and mixed coniferous/deciduous forest a bit farther up the watershed. Floods would readjust the river and stream profiles (after they succeeded in wearing away or breaking through the concrete dams and removing the earthen levees) and would eventually rejuvenate the soil. Groundwater tables would rise. This new human-less equilibrium would be dynamic and changing, as always, but with a periodicity far less than in the current era during which my species occupies the land. Browsing and grazing animals would return (many of which might be feral forms of contemporary, domesticated grazers), and carnivorous predators would prey upon them. Migratory waterfowl would again flock here by the hundreds of thousands, even millions. The land I live on has natural tendencies toward certain kinds of ecosystems and species, even though they change over time. The land mosaic and species mix following humans, however, will not replicate the ones preceding us. However, mine is a species of animal with a particularly elaborate and highly symbolic, self-reflective culture. For years, my particular continental group of our species has "located" itself mostly by means of zones, districts, and networks that have weak, nearly invisible, or incongruent relationships to the latent character and potential of the lands and waters that these districts overlie. The zones of heaviest human use of water are far removed from their sources. Energy is generated by fuels obtained thousands of miles from where they are converted into electricity, and the subsequently generated electrical power is further spatially distributed so that no real relationship can be shown between the source of power and its end use. City, county, state, and national boundaries ignore natural features. Transportation corridors for humans connect our own species, yet they disconnect and fragment countless other species. A majority of my food items travel an average of over one thousand miles before I consume them. The incongruity between our culturally constructed districts, zones, and networks and the natural abiotic and biotic tendencies of the lands upon which we live can be traced to the ways in which we understand where we are. To a great extent, we have forgotten where we live because we have ignored the natural dimension of the land. This incongruity is one of perception, scale, and time. We perceive ourselves to be principally residents of human compartments. The scale of these compartments is far too large or too unrelated to the essential structure and function of the natural living systems upon which we ultimately depend. The rates at which we alter ecosystems exceed the rates by which those systems can regenerate. And finally, the locations of origin of our material necessities, like the ultimate locations of the deposits of our wastes, are often far away from where we live. To presume to live only in human districts unrelated to local natural conditions leads directly to the exaggeration of the scale of human infrastructure and to the extraction of resources at rates far in excess of rates of natural regeneration. I am pursuing a simple, implicit premise here. Unless we humans can find ways to consider ourselves residents of natural regions and to clearly identify with endemic dimensions, limitations, and potentials of land, water, and other life-forms, we will not be able to live sustainably, and we will continue to overestimate the carrying capacity of the regions we inhabit. It makes little sense to discuss "sustainable development" at the global level if no thought is given to the local places and scales where human life actually takes place. The first step toward a regenerative future for humans is to reassess where we are. This book stalks its topic from several sides simultaneously, drawing on personal experience, objective theory, and the voices of other inhabitants. Chapters are hierarchical. The first two can be considered a foundation of sorts. I begin with "Grounding"—in the physical, geographic sense as well as the sense of locating oneself in place on the earth. I follow with "Living," discussing the nonhuman life of a place and the awakening of humans to that shared life. The next three chapters, "Reinhabiting," "Fulfilling," and "Imagining," deal with successively deeper notions of the human culture of place: associating, celebrating, and interpreting what it means to share a life-place. The remaining five chapters, "Trading," "Planning," Building," "Learning," and "Acting," form the operating manual for a life-place; here the bioregional notion is manifest in action, and the idea of a life-place returns, full circle, to the ground. Robert Thayer brings the concepts and promises of the growing bioregional movement to a wide audience in a book that passionately urges us to discover "where we are" as an antidote to our rootless, stressful modern lives. 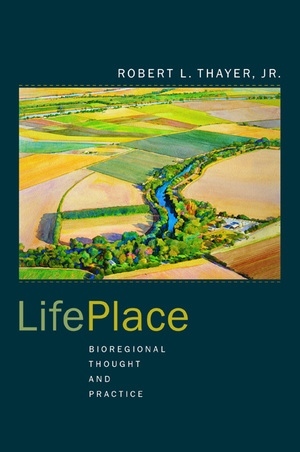 LifePlace is a provocative meditation on bioregionalism and what it means to live, work, eat, and play in relation to naturally, rather than politically, defined areas. In it, Thayer gives a richly textured portrait of his own home, the Putah-Cache watershed in California's Sacramento Valley, demonstrating how bioregionalism can be practiced in everyday life. Written in a lively anecdotal style and expressing a profound love of place, this book is a guide to the personal rewards and the social benefits of reinhabiting the natural world on a local scale. In LifePlace, Thayer shares what he has learned over the course of thirty years about the Sacramento Valley's geography, minerals, flora, and fauna; its relation to fire, agriculture, and water; and its indigenous peoples, farmers, and artists. He shows how the spirit of bioregionalism springs from learning the history of a place, from participating in its local economy, from living in housing designed in the context of the region. He asks: How can we instill a love of place and knowledge of the local into our education system? How can the economy become more responsive to the ecology of region? This valuable book is also a window onto current writing on bioregionalism, introducing the ideas of its most notable proponents in accessible and highly engaging prose. At the same time that it gives an entirely new appreciation of California's Central Valley, LifePlace shows how we can move toward a new way of being, thinking, and acting in the world that can lead to a sustainable, harmonious, and more satisfying future. Robert L. Thayer, Jr., is Professor Emeritus of Landscape Architecture in the Department of Environmental Design at the University of California at Davis. He is the author of Gray World, Green Heart: Technology, Nature and the Sustainable Landscape (1994).